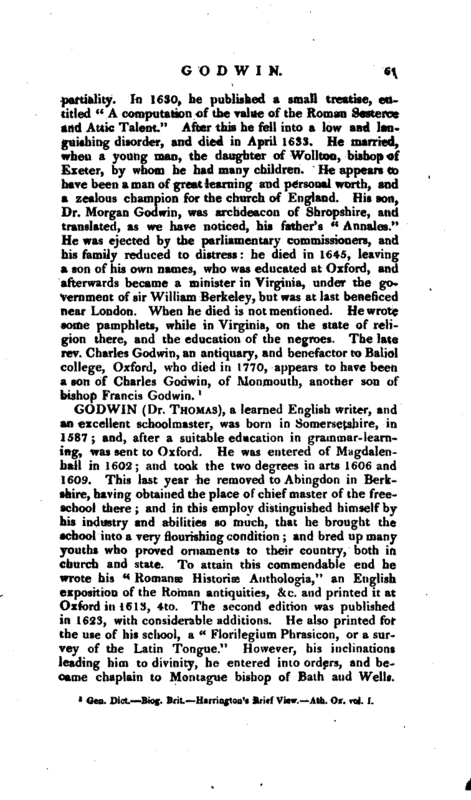 He had probably been sometime master of arts, when he entered into orders, and became in a short time rector of Satnrbrd Orcais, in Somersetshire, a prebendary in the church of Wilts, canon residentiary there, and vicar of Weston in Zoyland, in the same county; he was also collated to the sub-deanery of Exeter, in 1587. 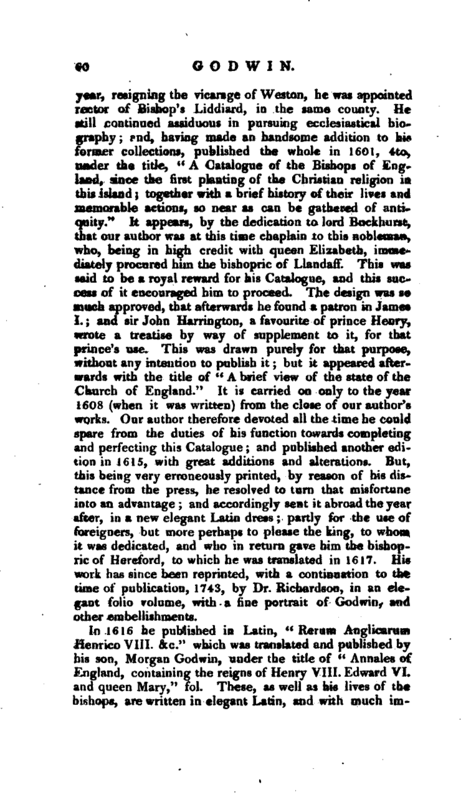 In the mean time, turning his studies to the subject of the antiquities of his own country, he became acquainted with Camden; and accompanied him in his travels to Wales, in 1590, in the search of curiosities. He took great delight in these inquiries, in which he spent his leisure hours for several years; but at length he confined himself to ecclesiastical antiquities and history. After some time, finding, with regard to these, that he could add little or nothing to Fox’s work on that subject, he restrained his inquiries to persons; and here he spared no pains, so that he had enough to make a considerable volume in 1594. He became B. D. in 1593, and D. D. in 1595; in which | year, resigning the vicarage of Weston, he was appointed rector of Bishop’s Liddiard, in the, same county. He still continued assiduous in pursuing ecclesiastical biography; and, having made an handsome addition to his former collections, published the whole in 1601, 4to, tinder the title, “A Catalogue of the Bishops of England, since the first planting of the Christian religion in this island; together with a brief history of their lives and memorable actions, so near as can be gathered of antiquity.” It appears, by the dedication to lord Buckhurst, that our author was at this time chaplain to this nobleman, who, being in high credit with queen Elizabeth, immediately procured him the bishopric of Llandaff. This was said to be a royal reward for his Catalogue, and this success of it encouraged him to proceed. The design was so much approved, that afterwards he found a patron in James I.; and sir John Harrington, a favourite of prince Henry, wrote a treatise by way of supplement to it, for that prince’s use. This was drawn purely for that purpose, without any intention to publish it; but it appeared afterwards with the title of “A brief view of the state of the Church of England.” It is carried on only to the year 1608 (when it was written) from the close of our author’s works. Our author therefore devoted all the time he could spare from the duties of his function towards completing and perfecting this Catalogue; and published another edition in 1615, with great additions and alterations. 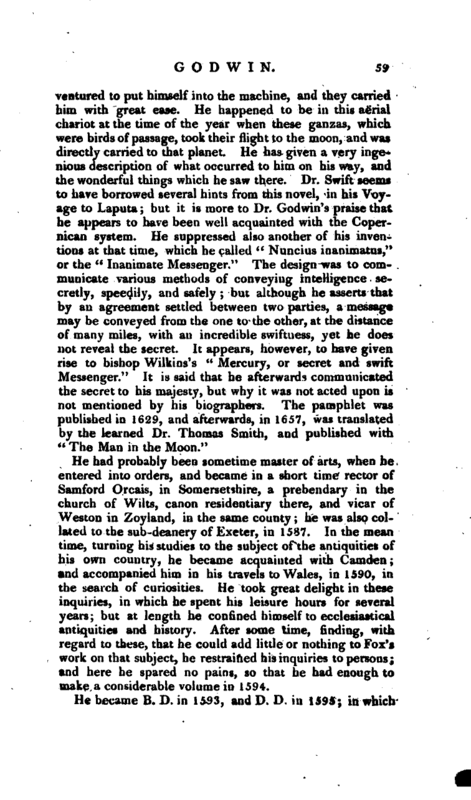 But, this being very erroneously printed, by reason of his distance from the press, he resolved to turn that misfortune into an advantage and accordingly sent it abroad the year after, in a new elegant Latin dress partly for the use of foreigners, but more perhaps to please the king, to whom it was dedicated, and who in return gave him the bishopric of Hereford, to which he was translated in 1617. 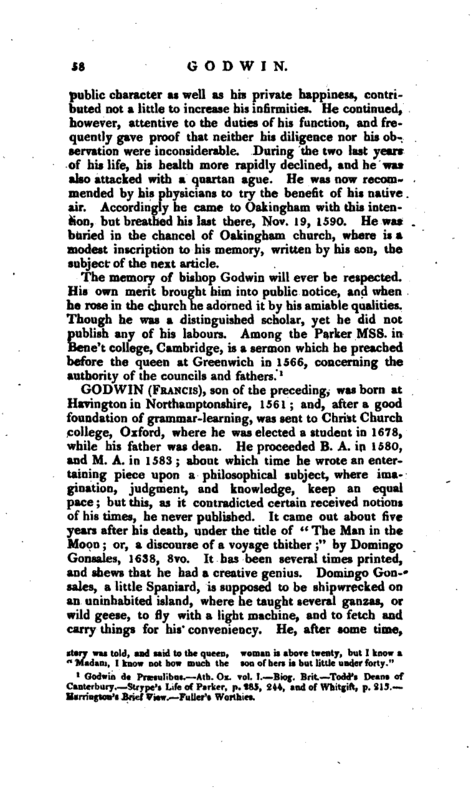 His work has since been reprinted, with a continuation to the time of publication, 1743, by Dr. Richardson, in an elegant folio volume, with a fine portrait of Godwin, and other embellishments. Gen. Dict. Biog. Brit. Harrington’s Brief View. —Ath. Ox. vol. I.